Ceremonial maces aren’t just symbols of a governing body, they’re works of art. When the Principal of the University of Edinburgh discovered that McGill didn’t have a mace, he put the students in his School of Design to work. Now the finely crafted fruit of their creativity is about to make its McGill debut. What’s one metre long, is made from Scottish oak and silver, and symbolizes McGill’s storied past and exciting future? The University’s new ceremonial mace. When Richard III was frantically canvassing Bosworth Field for a horse, the mace was still feared as a “bruising iron of wrath.” Today’s ceremonial mace, however, is a finely crafted work of art that symbolizes a governing body. Maces are now commonplace in legislatures (every Canadian province and territory has one), municipal councils and universities. In 2012, Sir Timothy O’Shea, the Principal and Vice-Chancellor of the University of Edinburgh, came to McGill to receive an honorary doctorate. When he learned that McGill didn’t have a mace, Sir Timothy proposed a gift. The Edinburgh College of Art, University of Edinburgh has an acclaimed School of Design, which had already created a mace as a gift for the University of the Highlands and Islands. Sir Timothy turned the McGill mace project over to Stephen Bottomley, director of the school’s Jewellery and Silversmithing programme. He, in turn, made it a senior undergraduate class competition. The students were given a design brief, which they supplemented with their own research, taking into account cultural and geographical references, as well as McGill’s long shared history with the University of Edinburgh and the University of Glasgow. After approximately six months, a short list emerged: three very different designs, created by Elizabeth Campbell, Georgina Leung and Joseph Metcalfe. Bottomley asked Stephen Strople which one McGill liked best. After consulting with various McGillians, including Professor David Covo in the School of Architecture, Strople returned an answer: Yes. So began a long, trans-Atlantic e-mail conversation, as the three students refined a single design. Joseph Metcalfe thought of the mace as a timeline, with the University’s founding symbolized by the base sphere (which is engraved with our founding year, 1821), a long shaft marking nearly 200 years of history, and a head representing a future of vast possibility. Georgina Leung’s idea of McGill as a beacon of education is reflected in the open design of the mace head, which nests a bowl in-side an armillary sphere. And if you look carefully at the champlevé enamel finish on that bowl, you’ll see Elizabeth Campbell’s interlocking martlets, maple leaves and fleurs-de-lis. Having experienced firsthand the “frosty splendour” of Canadian winter, while on exchange at the Nova Scotia College of Art and Design University, Campbell was also keen on an overall colour palette that echoed “an element of snowy whiteness.” (The students also worked in visual references to the McGill mace that never was: Sir Percy Nobbs sketched a proposed mace in 1929, but it was never created.) 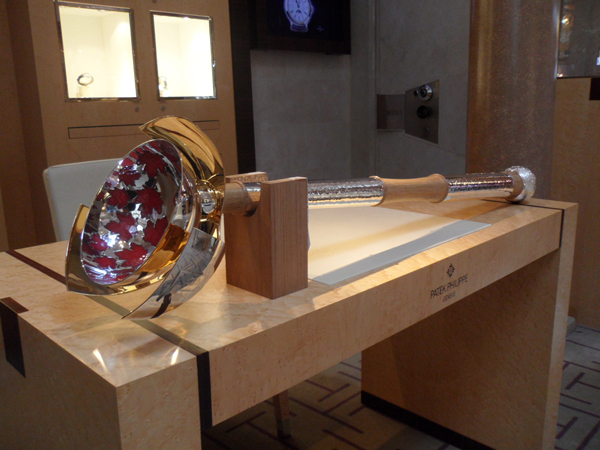 Various Scottish craftspeople, including the Hamilton & Inches silversmithing shops, crafted the final mace, which is 100 centimetres long, and made from Scottish oak and silver. As a symbol of the University’s authority to confer degrees, the mace will be on stage during convocation ceremonies, as well as other formal events. Chancellor Steinberg, however, will only get a small taste of this new tradition before his mandate ends next month. Although he’ll be overseeing the May 30 convocation ceremony for the Desautels Faculty of Management, during which Sir Timothy O’Shea himself will present the mace to the University, the mace won’t become a formal part of convocation proceedings until fall. Secretariat is still working out protocol, but the current thinking, says Strople, is that there will not be a single designated mace bearer (or “apparitor”). “We’re going to try to keep this an open process,” he says. “Sometimes it could be a student, sometimes it could be a teaching award winner, or a faculty member, or a staff member or…. Much in the way that we pick different honorary degree recipients and different hooders, we hope it will be seen as an honour to carry the mace and lead the convocation procession.